Arena Football • Utah owner disputes franchise is folding. 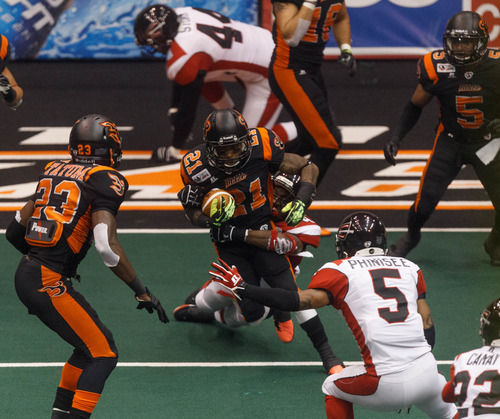 Trent Nelson | The Salt Lake Tribune Utah's LaVaughn Macon runs the ball as the Utah Blaze face the Cleveland Gladiators, AFL football at EnergySolutions Arena in Salt Lake City, Saturday July 27, 2013. Kim Raff | The Salt Lake Tribune Blaze fans taunt Storm player Michael Lindsey before a kick off during the first quarter of a game at EnergySolutions Arena in Salt Lake City on April 6, 2013. 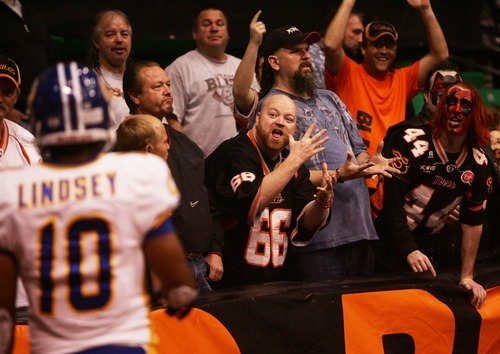 The Utah Blaze are, for the time being, left on the outside looking into the Arena Football League. The AFL announced Friday that the Blaze and Chicago Rush are two teams that did not submit proper documentation to committing to the 2014 and 2015 seasons. In previous offseasons, AFL owners gathered and committed to single seasons, but this offseason, owners decided to request two-year commitments. The Blaze and Rush did not submit commitment forms, thus leaving them out of the arena football picture in the near future. "We fully expect both Chicago and Utah to return to become members of the AFL family again in the near future," the release said. Along those lines, the AFL held a reassignment process in which players under contract with the Blaze and Rush were assigned to various teams around the league. "All AFL players are under contract to the league and assigned by the league office to member teams," the release said. "The AFL will continue its business practice of assigning players to member teams." A source told the Salt Lake Tribune that the Blaze will lose its entire roster to the reassignment process, but reiterated that it doesn&apos;t spell doom for the franchise itself. In a statement made to the Tribune Friday morning, Blaze majority owner Kim Brown said the franchise remains motivated to remain in the AFL. "Despite any rumors, the Utah Blaze are making substantial changes for a better 2014," said Brown in a statement. "As positive changes occur, we will keep you updated." Following the franchise&apos;s eviction from EnergySolutions Arena on June 20, Brown said a significant fiscal infusion from a new investor  which came in early July  helped the team pay its outstanding rent payments as well as work toward the financial stability and future of the Blaze. Both the Blaze and the Larry H. Miller Group of Companies announced that the previously agreed-upon contract at EnergySolutions Arena would continue on its scheduled track through the 2014 season. Both Brown and Arena Football League commissioner Jerry Kurz were not immediately available for comment.